1. Quiz: What is Cornish? A Celtic language originally spoken in Cornwall. Last speaker died in the early 19th century. 2. Quiz: What is the official language of China? 3. Quiz: Which newspaper claims to carry "all the news that is fit to print"? 4. Quiz: What is the peninsula containing Albania, Bulgaria, Romania, the European part of Turkey and most of Yugoslavia called? 5. Quiz: What are auroras? Luminous phenomena of the upper atmosphere that occur in high latitudes of both hemispheres. 6. Quiz: A group of islands in the Atlantic used to be called the Eternal Islands. Give their present name. 7. Quiz: Name the political scientist who suggested in 1992 that now that the conflict between Communism and Capitalism was over the only problems mankind would have to solve were technological ones and, hence, "history has ended". 8. Quiz: Who were called "the philosophers of the garden"? The followers of Epicurus, who taught in a garden. 9. Quiz: Who developed the Theory of Aggregate Demand? 10. Quiz: Name the thinker who said that men's minds are beset with 'Idols' which prevent clear thinking and that the four classes of idols were ldols of the Cave, ldols of the Tribe, ldols of the Market Place and idols of the Theatre. 11. Quiz: By what name are the followers of Zeno, the Greek philosopher known? 12. Quiz: What did Carl Jung call his system of psychology, to distinguish it from Freud's methods? 13. Quiz: What does BP mean with reference to time? 14. Quiz: Who are the Inuit? Eskimos. (The self-governing Eskimo territory in north western Canada is also called Inuit). 15. Quiz: What do Tupolov, Antonov and Illuyshin have in common? 16. Quiz: What is Lysenkoism? The unscientific idea, propagated by Tromfin Lysenko, Stalin's favourite biologist, that acquired characteristics are inherited. 17. Quiz: Which organization has the motto 'Be prepared'? 18. Quiz: What is a Zeppelin? 19. Quiz: What was the name of the mission that first landed men on the moon? 20. 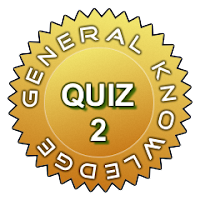 Quiz: A Republican senator gave his name to a phenomenan. What phenomenon? 21. Quiz: Who coined the term 'glasnost? 22. Quiz: Of which city state was Marco Polo a native? 23. Quiz: Name the two places linked by the Silk Route. 24. Quiz: What is an amphora? 25. Quiz: Name the game played on a 'diamond'. 26. Quiz: What is the gammadion cross? 27. Quiz: Name the rivers that flow into the Shatt-al-Arab waterway. 28. Quiz: What in agriculture is the three-field system? 29. Quiz: Name the man who first organised conducted tours. 30. Quiz: What are the official languages of Singapore? Chinese, English, Malay and Tamil.